Wednesday, 27 February 2019, 2:41p.m. Residents evacuated from their homes after another fire in the Nelson region have been allowed to return home tonight - but they must stay ready to evacuate again at short notice. The Tasman-Marlborough Fire Area said just before 8.30pm that the majority of people have been given the green light to go home after being evacuated this afternoon for safety reasons. However, families from five of the 97 properties evacuated will not be able to return home, as a precautionary measure. Those residents live on the Moutter Highway. "Cordons remain in place at the intersections of Maisey Rd and Moutter Highway and Old Coach Rd and Moutter Highway,'' a statement said. Today's fire was reported shortly before 1.30pm north of Pigeon Valley, where huge wildfires began three weeks ago. At a media briefing just after 6.30pm, authorities confirmed that the blaze - covering about 4ha now - had been contained and was no longer moving. A Fire and Emergency representative said crews had since slowed the momentum of the fire. "We have a controlled line around the fire,'' he said. Firebreaks were bulldozed on three sides of the blaze, while a road provided a firebreak on the fourth side. Residents who have been evacuated will find out about 7.30pm whether it is safe for them to return to their homes. Tasman mayor Richard Kempthorne thanked the Redwood Valley community for their co-operation and acknowledged that the evacuations needed to happen. Fire authorities reiterated that; revealing that at one point, the blaze was within about 1km of Redwood Valley properties. Battling the blaze has been a huge effort. Seven helicopters were called out to tackle the fire near the Moutere Highway. A total of 16 fire trucks and two bulldozers were also sent to the scene. An update just after 5pm said the blaze had been stopped at the foot of the gully where it first started. It was in standing pine heading into grassland and was covering about 5ha at that time. Fire crews were confident then that they would be able to control the blaze; despite windy and dry conditions in the area. "A combination of the ability to move crews and resources quickly from Pigeon Valley fire and the downhill direction of the initial blaze have been the determining factor in the current containment of the fire,'' a statement from fire authorities said. Despite the blaze being under control, there was still work to do and helicopters working in the effort will do so until nightfall; while crews and machinery on the ground will carry on the effort overnight. Fire and Emergency said those wanting to mow their lawns are encouraged to do so in the morning - the safest time, they said. West Coast-Tasman MP Damien O'Connor earlier told Herald Focus Live seven families had been evacuated from the Moutere Highway. Residents were advised to go to the Tasman-Marlborough Fire Area Facebook page for updates. "It's not intensely occupied there, mostly lifestyle blocks, but it is close to a lot of sub-divisions and so hopefully we can control it before it moves into a more intense residential area." O'Connor said it's not clear whether this is a flare-up from the earlier fire or a secondary fire. "Everyone has been warned that this is a possibility until we get some decent rain. Everyone will have been on high alert and hopefully the response is quick enough to keep this fire under control." Redwood Valley B&B owner Maria Middlebrook-Wells says she called 111 after she saw smoke over the hill. "We've got helicopters going over now with monsoon buckets. I'll get a few things together, but I actually didn't take everything out from the last time I packed. "I was hoping it was further away than what it was... It's probably a little closer than I want it to be." The fire doubled in size in an hour this afternoon and spread rapidly. Police were assisting with the evacuation of houses on the Redwood Valley side of the highway. Pictures posted on social media show a section of forest engulfed in large flames right next to the highway. Facebook user Jesse Whittaker said the fire was moving over the grass towards the trees. A state of emergency relating to the Pigeon Valley fires had been lifted earlier in the day but authorities had warned the fire risk remained extreme "and a single spark could create a large fire." Police this afternoon told residents living on a stretch of Moutere Highway to evacuate from their properties. People on property between Old Coach Rd and Maisey Rd were told to leave immediately and police were following up with evacuation patrols. In addition, anyone in the area who was feeling unsafe or threatened was advised to self-evacuate as a precaution. Evacuees were asked to register with the Welfare Centre and the New Life Church at 85 Wensley Rd, in Richmond, by calling (03) 543 8400. This morning, mayor Richard Kempthorne confirmed a decision had been made to allow the state of emergency to expire. "There has been a huge effort from all agencies involved, to ensure the threat to people, animals and property is alleviated," Kempthorne said. 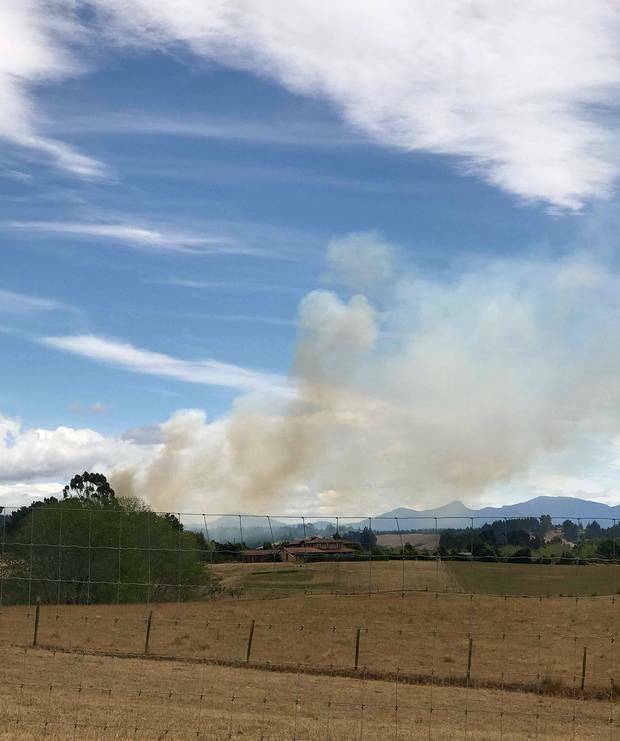 Nelson Tasman Civil Defence said residents in the Redwood Valley area should be prepared to evacuate should the blaze escalate. Only two hours earlier Civil Defence had urged residents to remain vigilant and stop and think before undertaking any outdoor activity which could create a spark, such as lawn mowing, using firearms or welding or metal cutting. At 3pm, MetService recorded westerly winds at 30km/h with wind gusts up to 41km/h. The temperature was just over 23C. The wind direction was expected to shift to a southwest direction this evening. Niwa said severe drought is occurring in parts of the Tasman District and Nelson is tracking toward its third driest and third warmest summer on record. Only 14mm of rain has fallen in Nelson over the past two months, MetService said. MetService meteorologist Rob Kerr said rain clouds are sweeping up the South Island today, but the Nelson region will likely miss out. "We do have a front moving up the country today with north-northwest winds being replaced by cool southwest and as that front moves through generally there will be some rain," he said. "Unfortunately where the fire is, it's likely to miss out - they may get some spots of rain but nothing of any significance. "In terms of winds, things do get a bit more interesting there ... winds there are currently 30km/h, gusting 45km/h and they're coming off the ranges." Kerr explained humidity is low in the region, sitting around 39 per cent, and adding with the winds there is little moisture in the air which makes fire travel quicker. The region can expect similar wind speeds throughout the evening and night with more dry weather expected for the rest of the week as a ridge of high pressure follows the front.